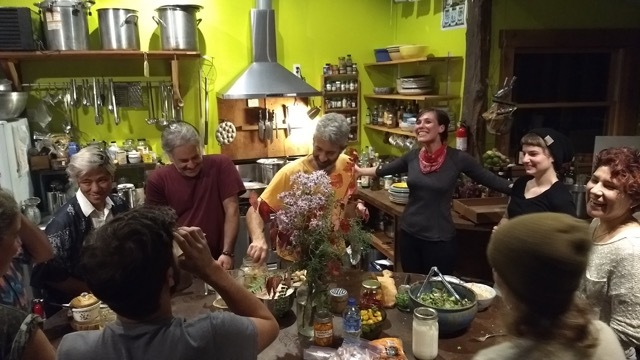 For six days in November I had the incredible honor to learn from my fermentation guru, Sandor Katz, at his home in Tennessee. The fall colors were showing out, and I learned more in those few days than I think I could have learned on my own in many years. 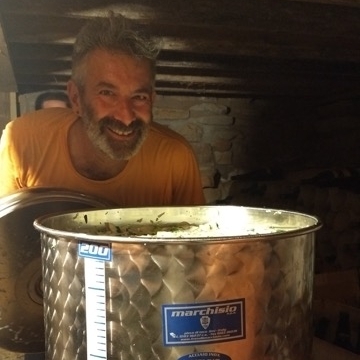 Sandor is affectionately known as the "father of the modern fermentation movement" - the books he has written about fermentation have sparked a fermentation revival in recent years. What I appreciate most about him is the way he encourages people to experiment at home. I think because of the commonly mistaken conflation of fermentation and home canning, there is a generalized fear about fermentation and food safety. As Sandor says, "Fermentation is about as safe as food gets." According to the USDA, there has not been a single case documented of sickness related to fermented food in the US or in any of the countries that share info with us. His writing has helped people - including myself - reclaim traditional practices of fermentation, experiment with new creative flavors, and lift out of the fear that we canʻt do this for ourselves. He seems fond of saying, "Thereʻs very few wrong answers in fermentation. The most limiting factor is your imagination." I've written about my appreciation for his political analysis around fermentation as a force for social change. I feel like it is an important thing that the man who birthed a modern fermentation movement is an out, radical queer who has been active with ACT UP and and has been living with HIV for decades. It is significant to me that he lives with a community of Radical Faeries in the woods of Tennessee, and his work is respected locally as well as worldwide. This gives me hope. During our time at his house, Sandor was incredibly generous with his knowledge. He was up at dawn cooking sourdough pancakes on the griddle and answering questions from us to start each day, and we went on through the days and into the evening learning from his experience and experimenting alongside him. He hosts this Fermentation Residency at his home twice a year, it's a pretty competitive pool of applicants, from what I could tell. There were 12 of us in total, others coming from as far away as Australia, Equador, Mexico, and Canada. In the span of a few days, we learned with him how to make: sourdough, Buckwheat bread, barley Koji and an experimental sweet potato Koji, Tempeh, Sake, Chickpea miso, Nixtamal, Dosa, Goat Cheese Chèvre, Yogurt, Veggie Pickles, Sweet potato hot sauce, Do Ban Jiang, Fermented pesto, Pau-cai, Kvas, Sweet potato fly, Kimchi, and we talked through how to make a bunch more. I was furiously taking notes, pictures, and trying to soak in as much as I could. In addition to fermenting at Sandorʻs house, we also ventured out into the community to visit other fermentation friends, including the good folks run Short Mountain Cultures, where they make kombucha, water kefir, coconut kefir, kvass, sauerkrauts, tempeh, and other fermented goodies for sale. 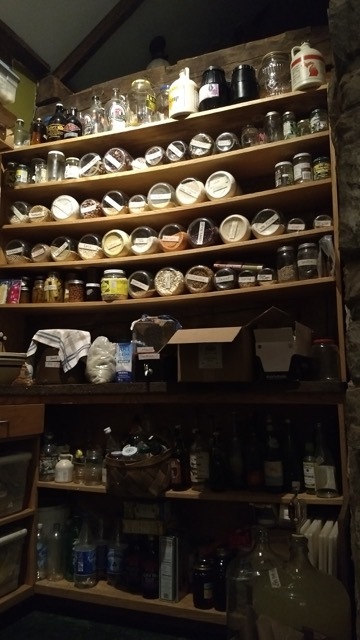 This visit was especially helpful for me, as I'm in the process of figuring out if and how to create my own Gut Feelings fermentation business, and I was so inspired by what I learned from them. We also took a day trip out to the Barefoot Farmerʻs biodynamic farm to harvest a literal truckload of veggies, which we brought back to the house, and processed into 200 liters of fermented goodness that will be shared with this community later in the year. Jeff Poppen, aka "the Barefoot Farmer," taught us about the roles of microbes on the farm, including our nitrogen fixing friends and fungal mycorrhizal relationships that create connectivity between the soil, plants, and surrounding ecosystem. I came away from that week with so much: learning, inspiration, ideas, and starters! Since I returned home I've been slowly making may way through my notes, trying out new ferments, and seeing how things work here in our own microclimate. Sandor shared his sourdough starter with me - it has roots from families in Romania and Germany, but he is insistent that once you bring it home it becomes uniquely your own by incorporating the bacteria and yeasts of your environment. One of the main daily practices I've come home with is baking sourdough bread. I had been afraid of sourdough since I had my previous starter go putrid on me, and I learned some really helpful tips from Sandor and the other students in the residency that have allowed me to revive sourdough in my life! I'm obsessed now, and will post specifically about sourdough soon. I've also been finding ways of sharing what I'm learning with others here at home. I'm starting to do workshops, including this lacto-fermentation workshop for the elders in my neighborhood, organized by KEY Project, our local community center that serves free breakfast for the seniors every Wednesday and Friday. They were so enthusiastic about the workshop - telling me about the fermentation practices of their grandparents, and how they are excited to start fermenting with their own grandchildren. I'm looking forward to more learning and sharing - this feels like another beginning. Thanks so much to Sarah Lantz of Buchi Brew and Dayna Teves of KEY Project for some of these photos!